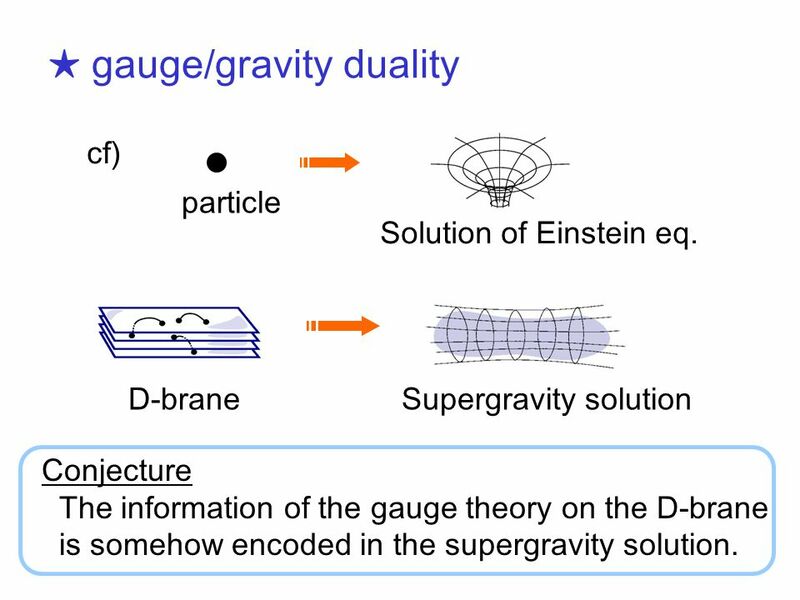 Analysis of QCD via Supergravity S. Sugimoto (YITP) based on hep-th/0412141 (T. Ibaraki + S.S.) Windows to new paradigm in particle Sendai. 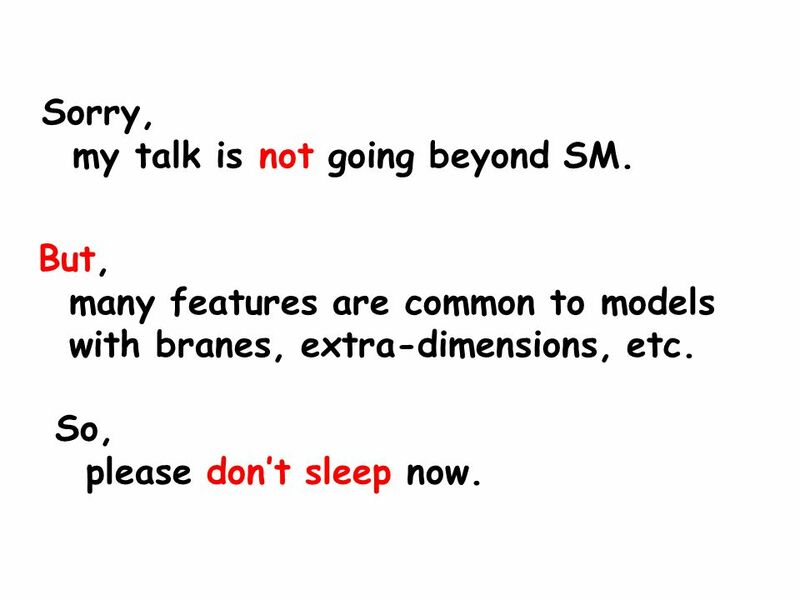 2 Sorry, my talk is not going beyond SM. 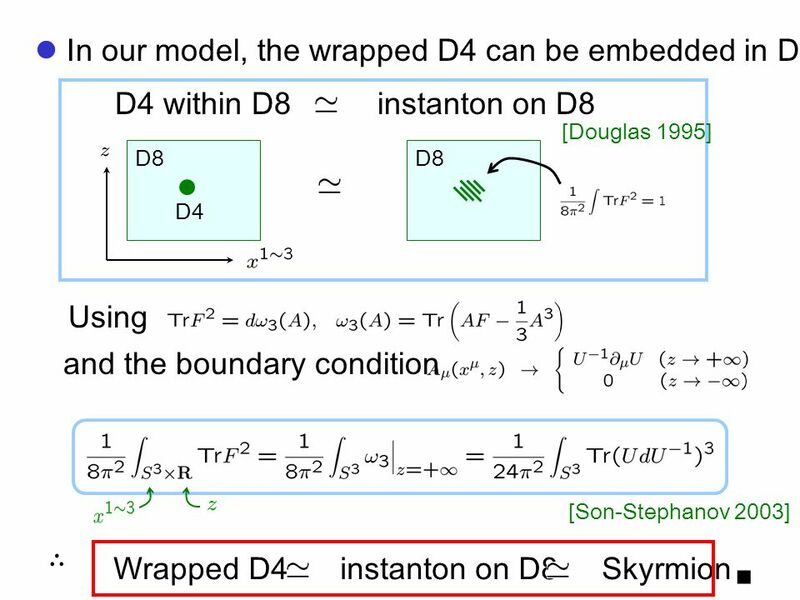 But, many features are common to models with branes, extra-dimensions, etc. So, please don’t sleep now. 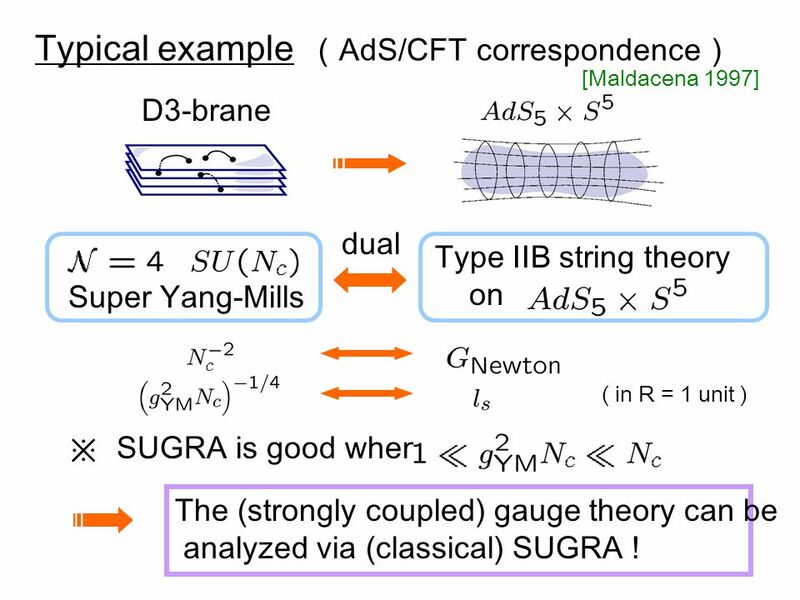 5 [Maldacena 1997] D3-brane Type IIB string theory on Super Yang-Mills dual ( in R = 1 unit ) Typical example （ AdS/CFT correspondence ） ※ SUGRA is good when The (strongly coupled) gauge theory can be analyzed via (classical) SUGRA ! 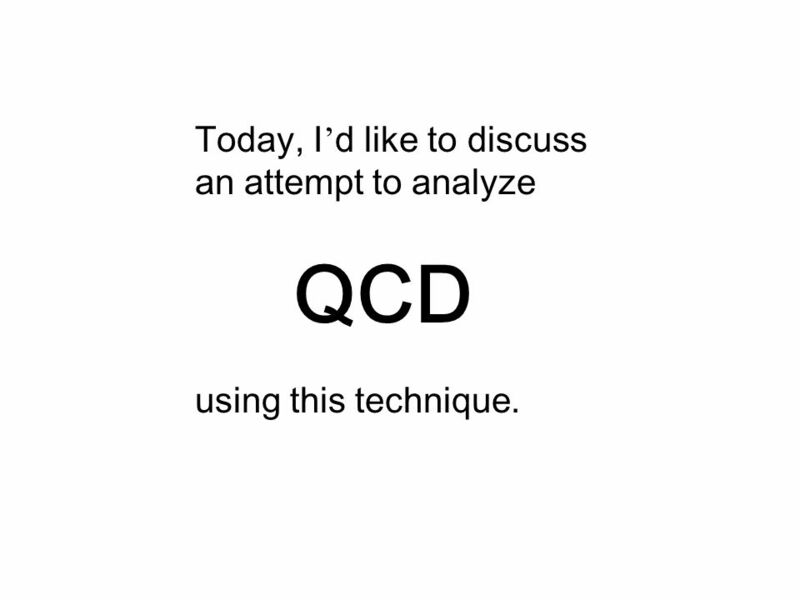 6 Today, I ’ d like to discuss an attempt to analyze QCD using this technique. 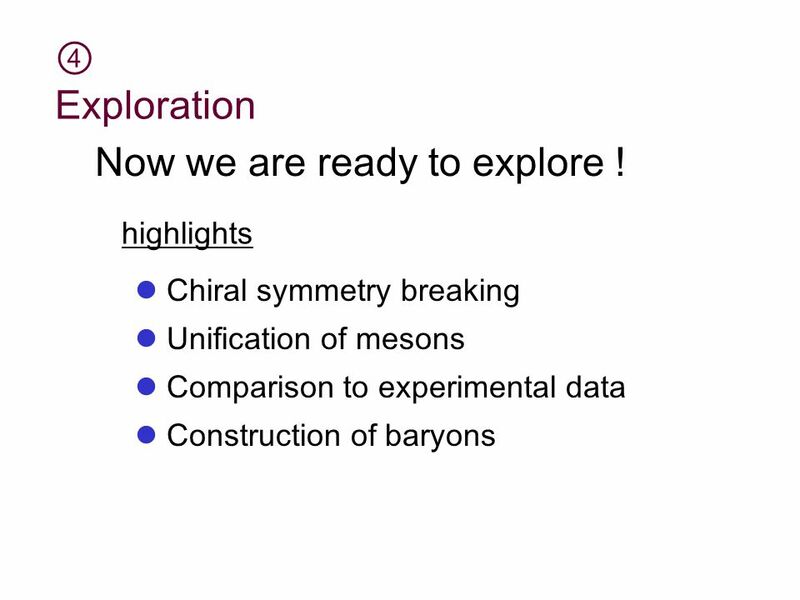 14 ★ Where are mesons? 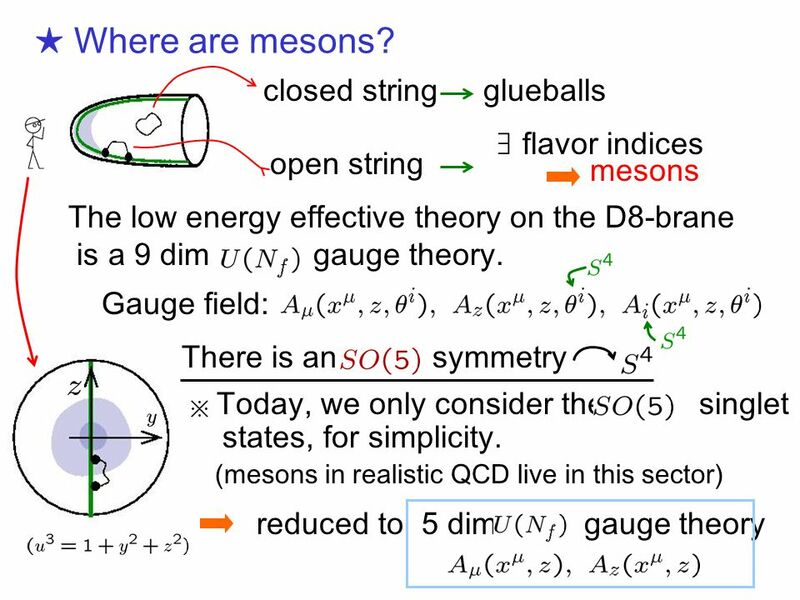 closed string open string glueballs mesons ∃ flavor indices reduced to 5 dim gauge theory The low energy effective theory on the D8-brane is a 9 dim gauge theory. 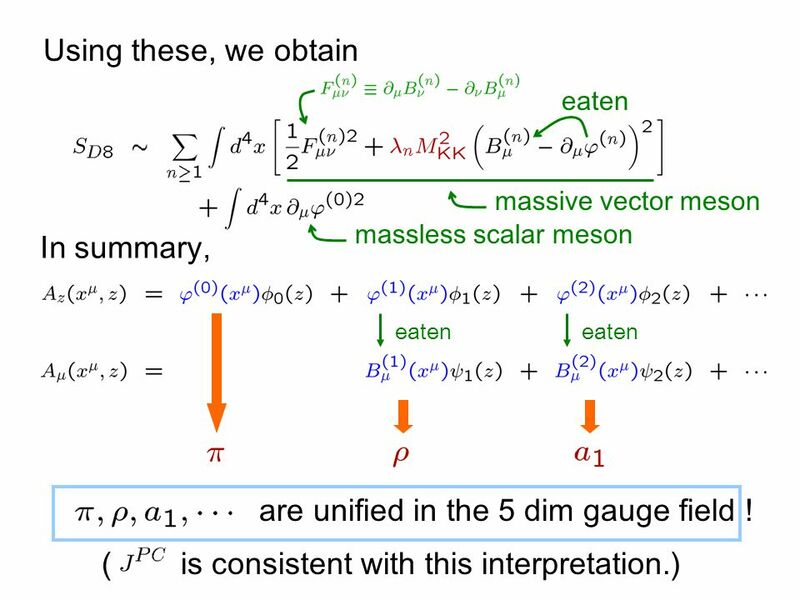 Gauge field: There is an symmetry (mesons in realistic QCD live in this sector) ※ Today, we only consider the singlet states, for simplicity. 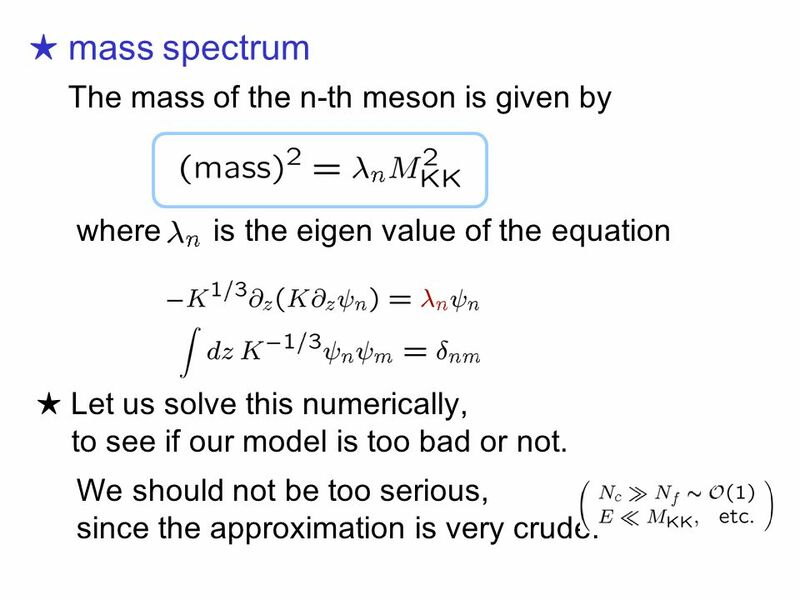 19 ★ mass spectrum The mass of the n-th meson is given by where is the eigen value of the equation ★ Let us solve this numerically, to see if our model is too bad or not. 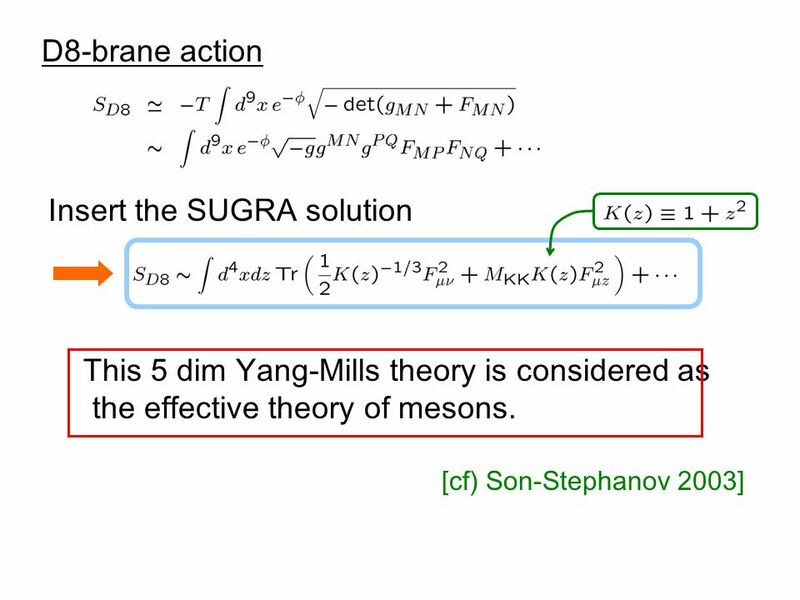 We should not be too serious, since the approximation is very crude. 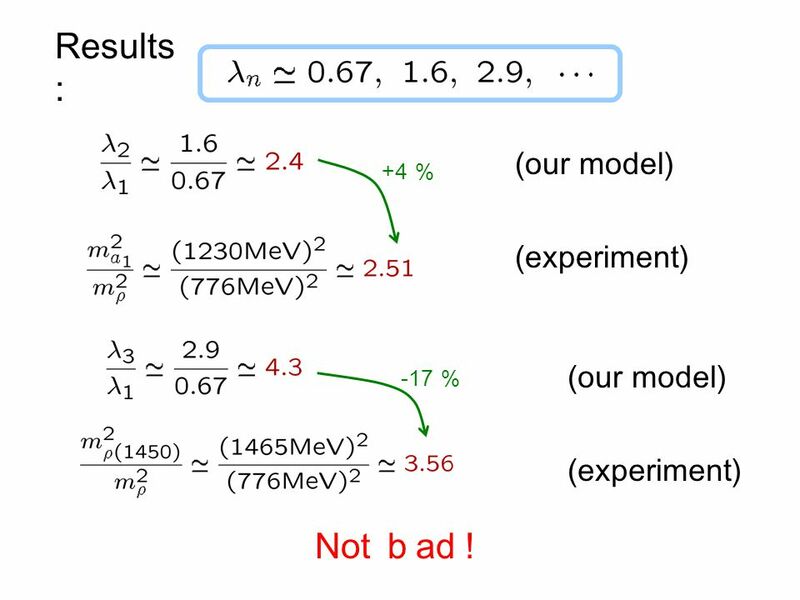 20 Results : (our model) (experiment) +4 ％ -17 ％ (our model) (experiment) Not ｂ ad ! 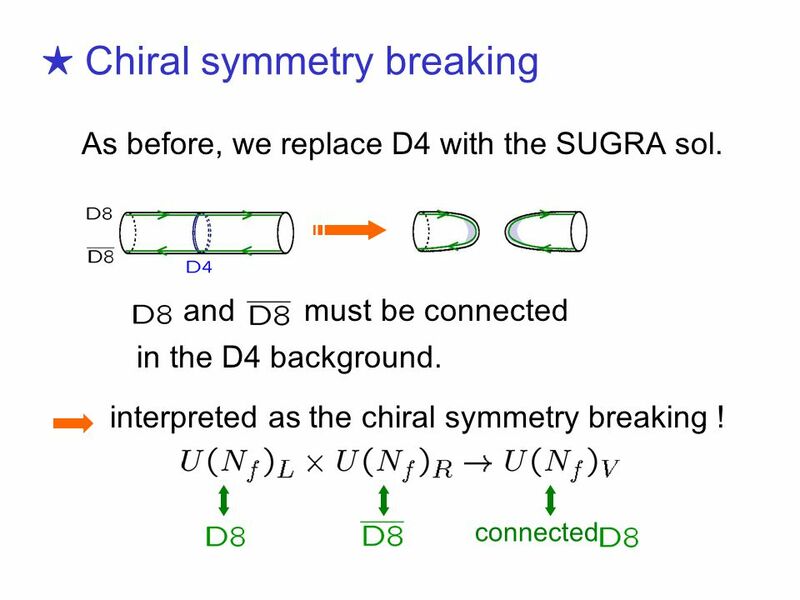 29 ⑤ Summary Chiral symmetry breaking is understood geometrically. 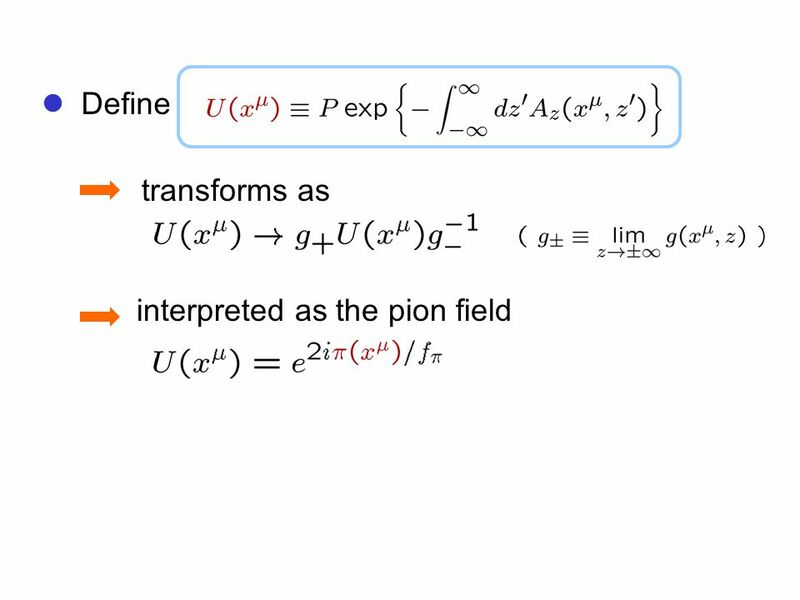 Mesons are unified in the 5 dim gauge field. 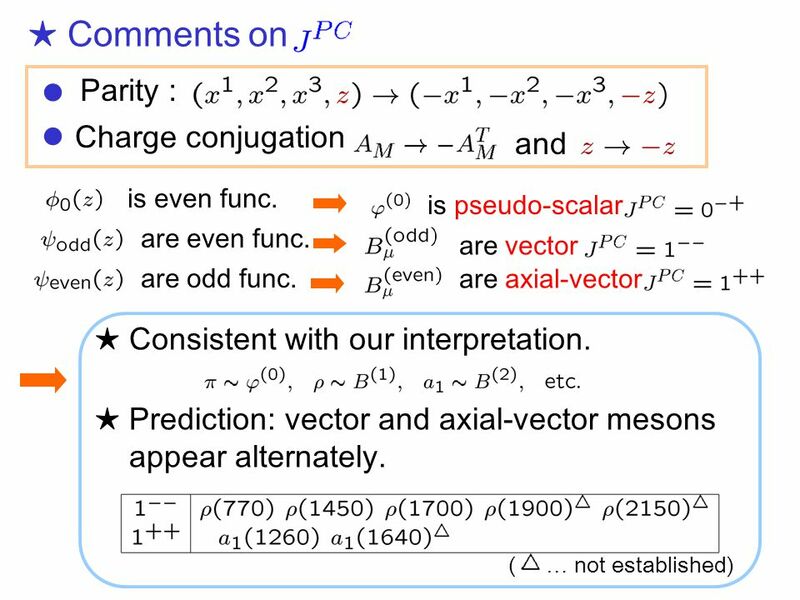 ★ The numerical results are also encouraging. 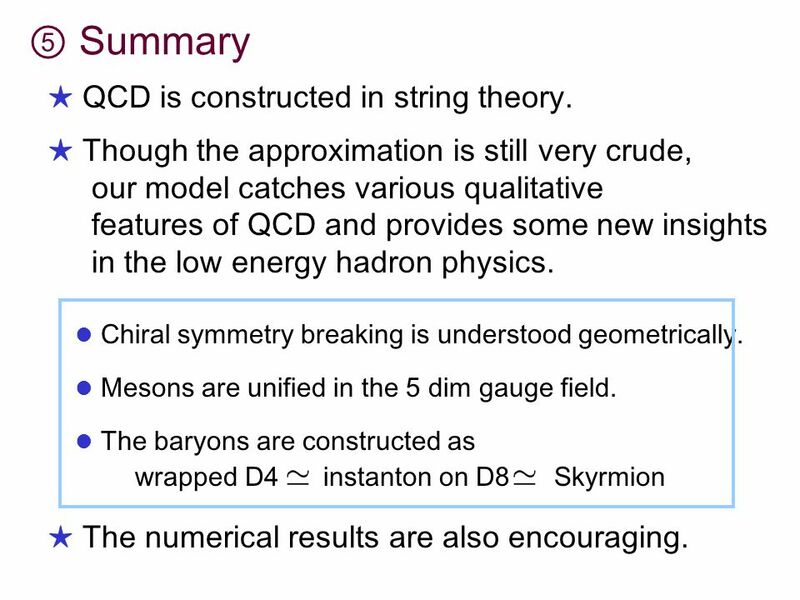 The baryons are constructed as wrapped D4 instanton on D8 Skyrmion ★ Though the approximation is still very crude, our model catches various qualitative features of QCD and provides some new insights in the low energy hadron physics. 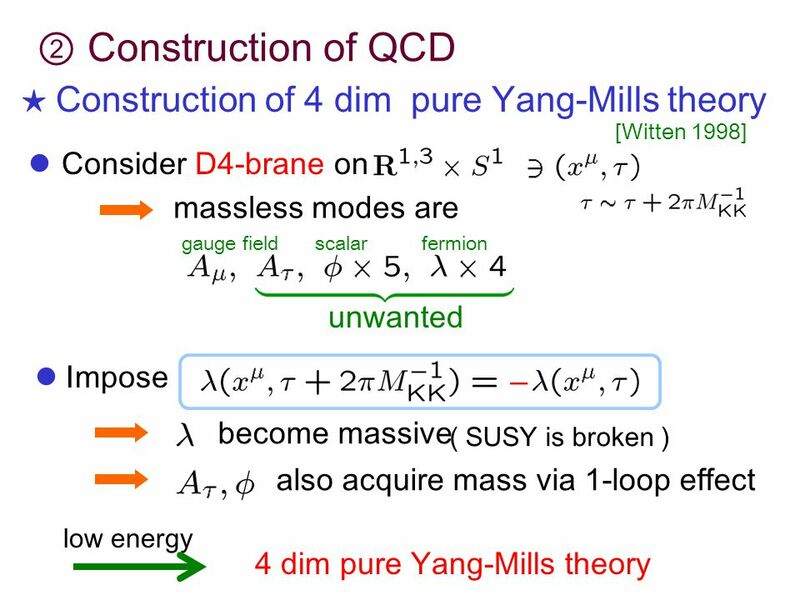 ★ QCD is constructed in string theory. 30 Chiral anomaly and axial anomaly are reproduced. 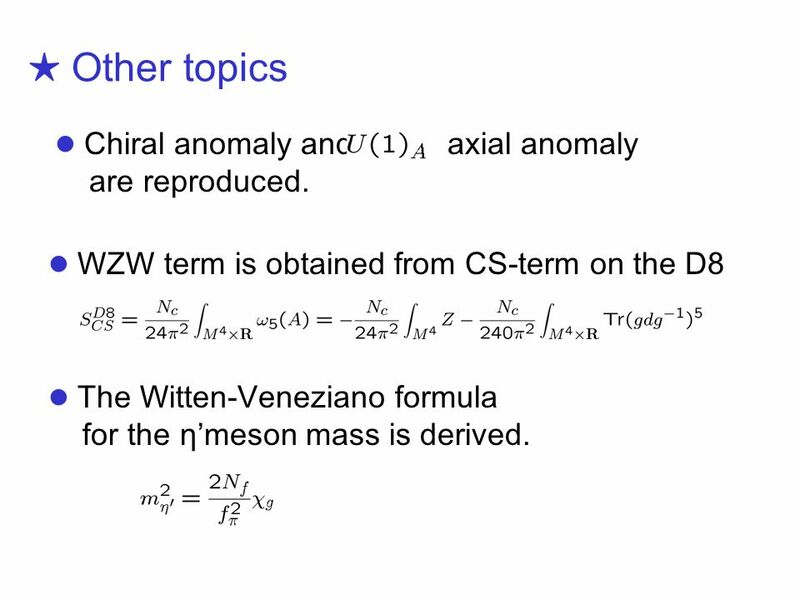 ★ Other topics WZW term is obtained from CS-term on the D8 The Witten-Veneziano formula for the η’meson mass is derived. 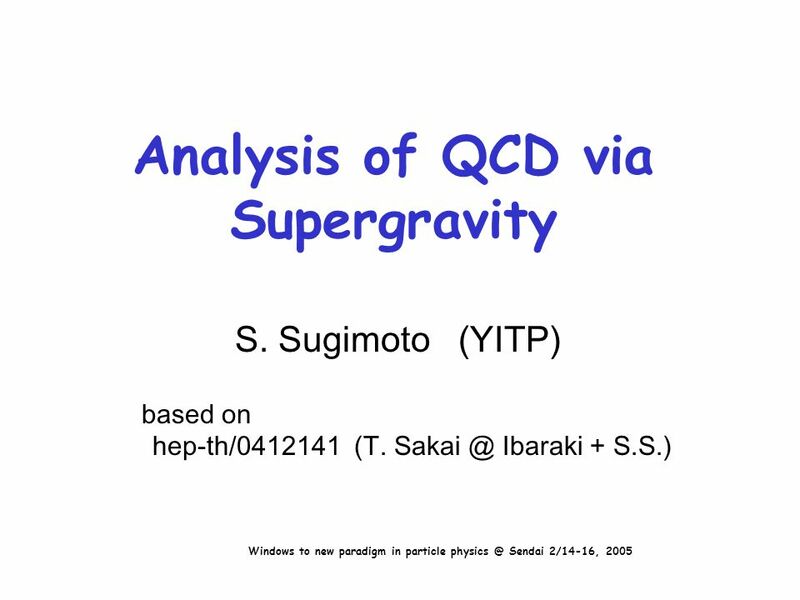 Download ppt "Analysis of QCD via Supergravity S. Sugimoto (YITP) based on hep-th/0412141 (T. Ibaraki + S.S.) Windows to new paradigm in particle Sendai." 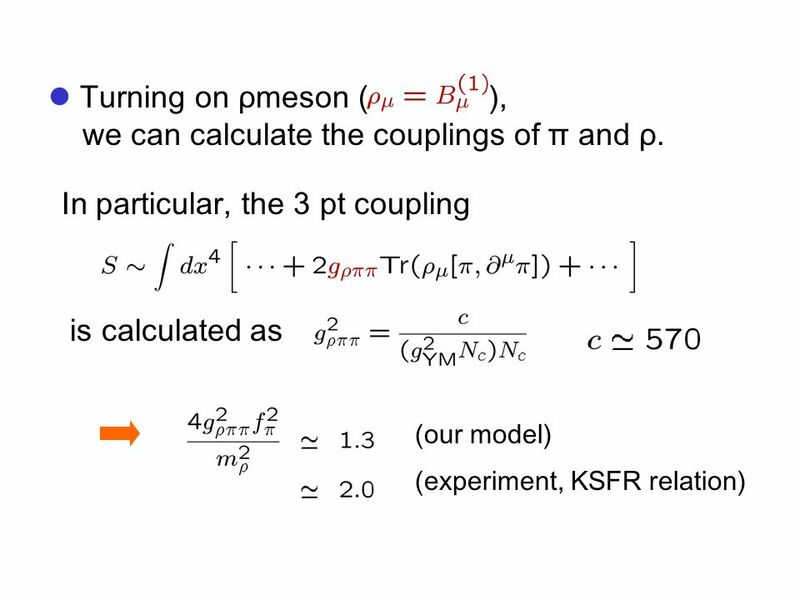 Electroweak Symmetry Breaking from D-branes Joshua Erlich College of William & Mary Title U Oregon, May 22, 2007 w/ Chris Carone, Marc Sher, Jong Anly. 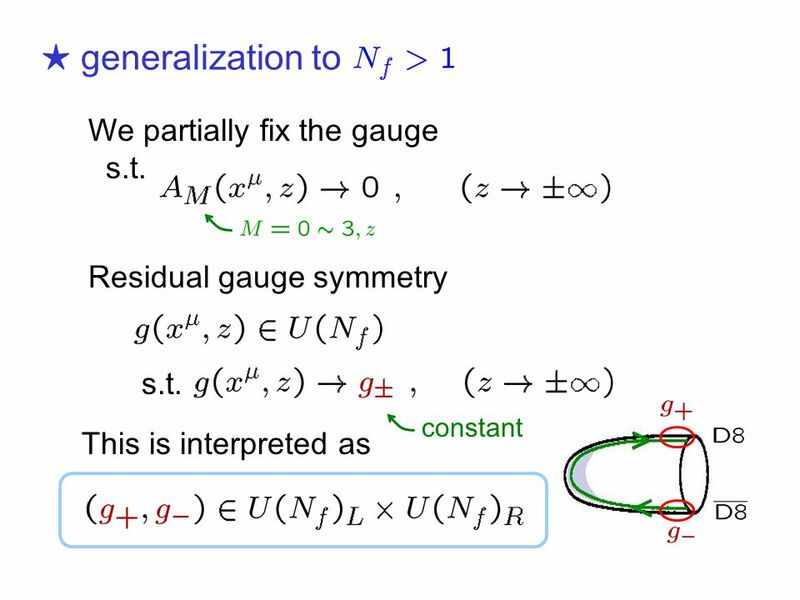 Electroweak Symmetry Breaking from the D4-D8-D8 System Joshua Erlich College of William & Mary Budapest, June 25, 2007 w/ Chris Carone, Marc Sher, Jong. 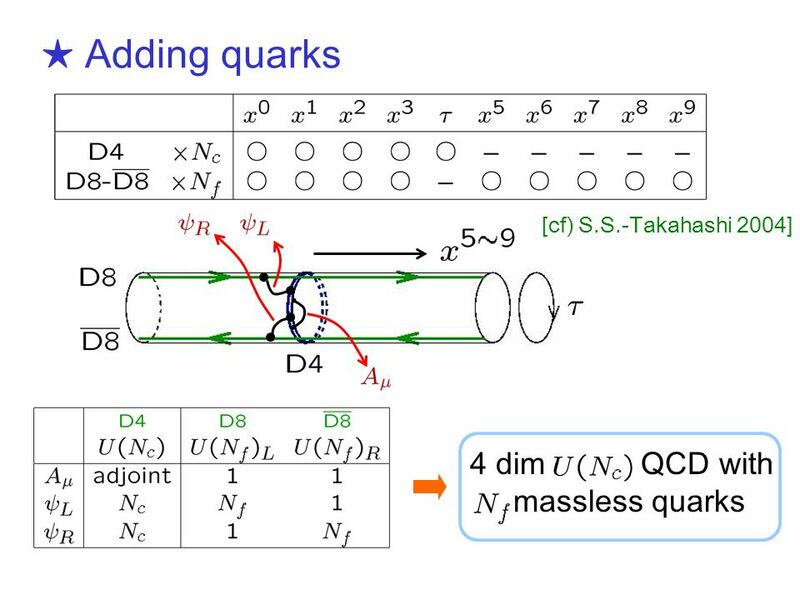 Based on arXiv:1107.xxxx with G. Mandal (TIFR) What is the gravity dual of the confinement/deconfinement transportation in holographic QCD Takeshi Morita. 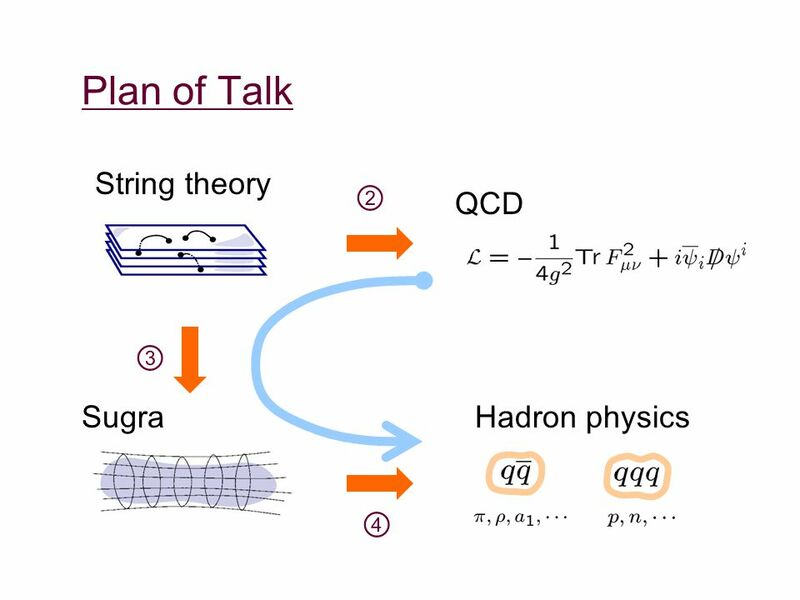 1 Holographic description of Hadrons from String Theory Shigeki Sugimoto (IPMU) Rencontres de Moriond, March 25, La Thuile, Italy (based on works. 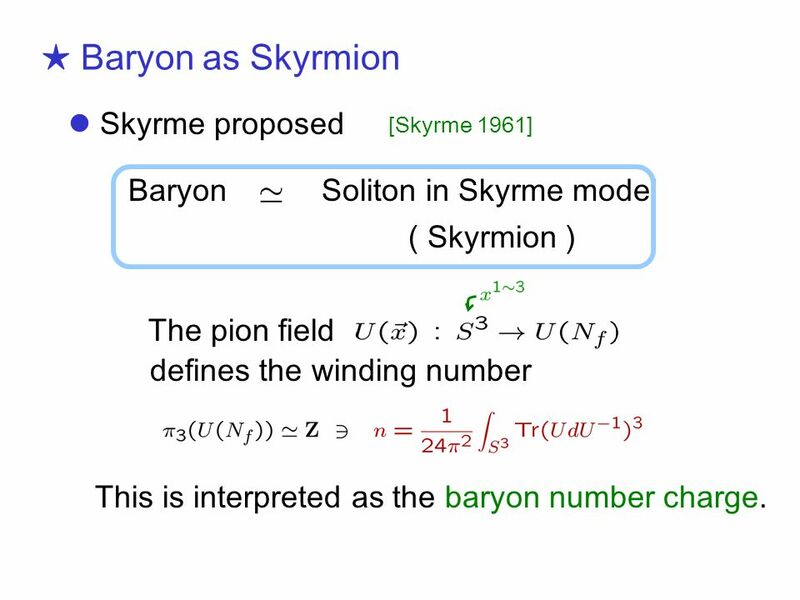 Two Approaches to Holographic Baryons/Nuclei PILJIN YI (KIAS) 5 th APFB, Seoul, August 2011 Koji Hashimoto Deog-Ki Hong Norihiro Iizuka Youngman Kim Sangmin. 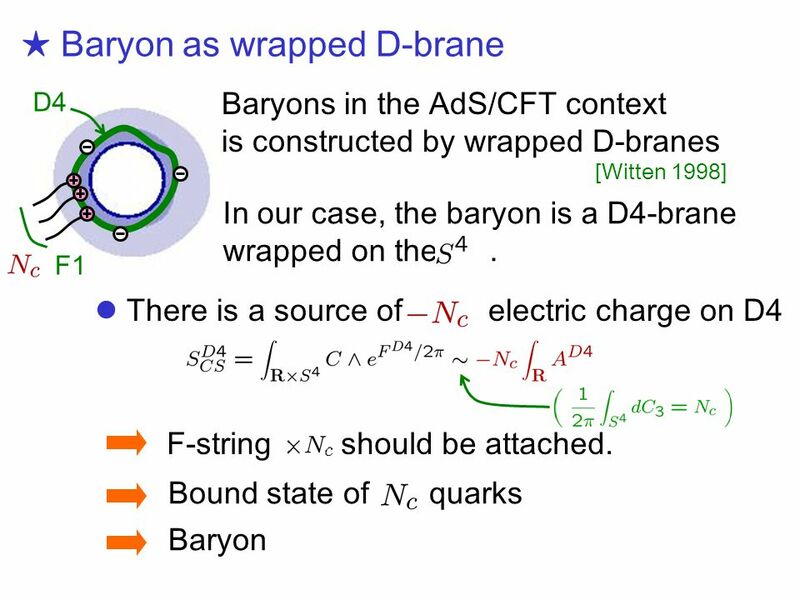 On d=3 Yang-Mills-Chern- Simons theories with “fractional branes” and their gravity duals Ofer Aharony Weizmann Institute of Science 14 th Itzykson Meeting. 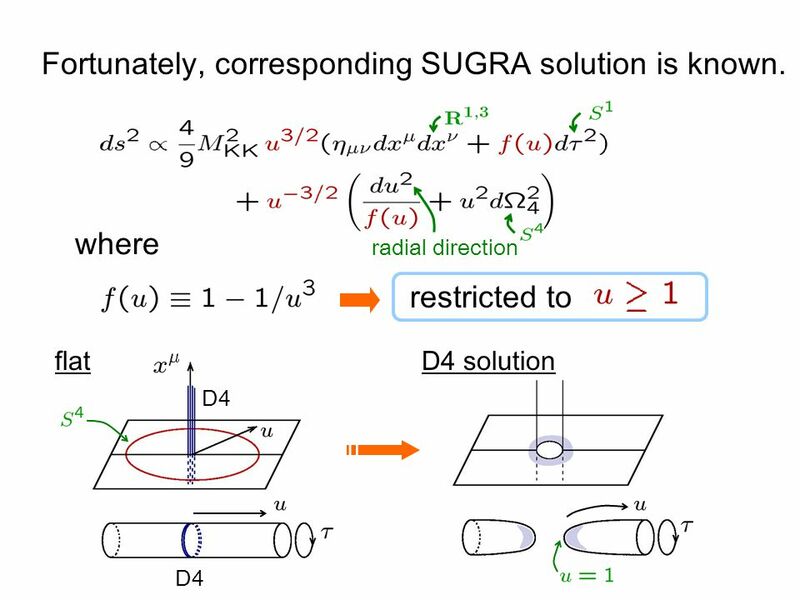 Baryons with Holography Hideo SUGANUMA ( Kyoto Univ. ) 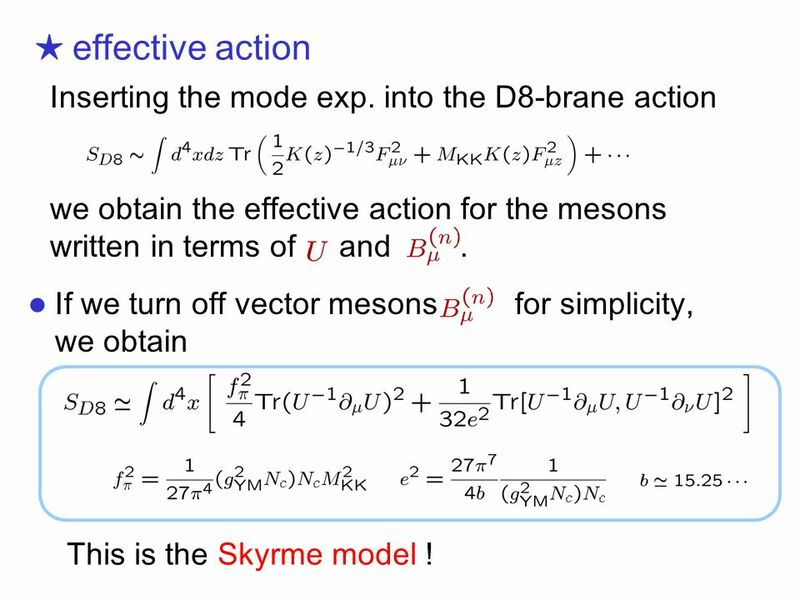 Toru KOJO ( Kyoto Univ. ) Kanabu NAWA ( RCNP ) in collaboration with. 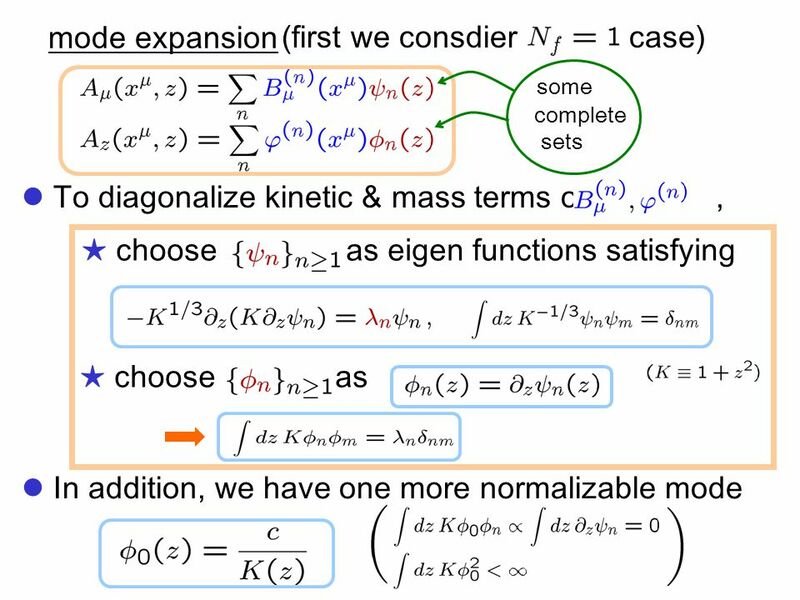 Toward a Proof of Montonen-Olive Duality via Multiple M2-branes Koji Hashimoto (RIKEN) 25th Sep conference “Recent Developments in String/M. 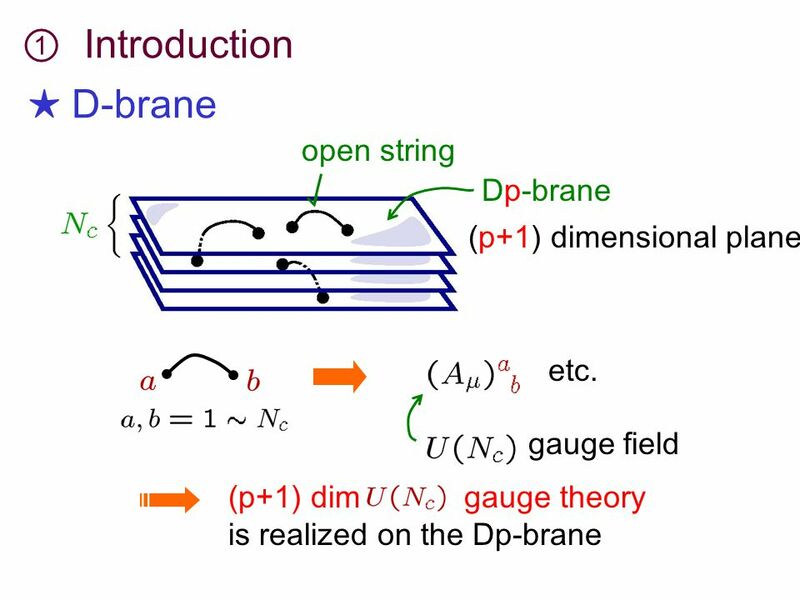 8/1(Thu), 2013 Parallel talk (Theoretical development) Daisuke Kadoh (KEK) D.K. 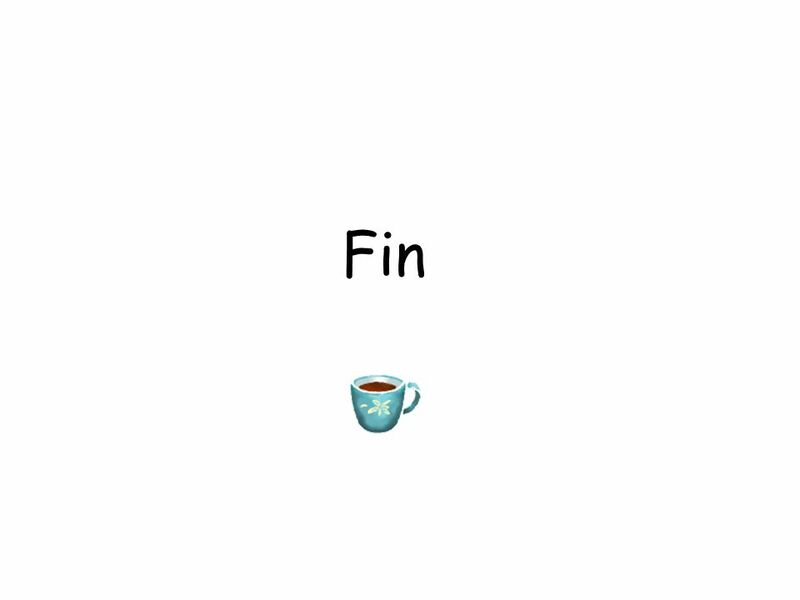 and Syo Kamata, in preparation TexPoint fonts used in. Precision Holographic Baryons PILJIN YI (KIAS) Baryons 2010, Osaka, December 2010 Koji Hashimoto Deog-Ki Hong Norihiro Iizuka Youngman Kim Sangmin Lee. 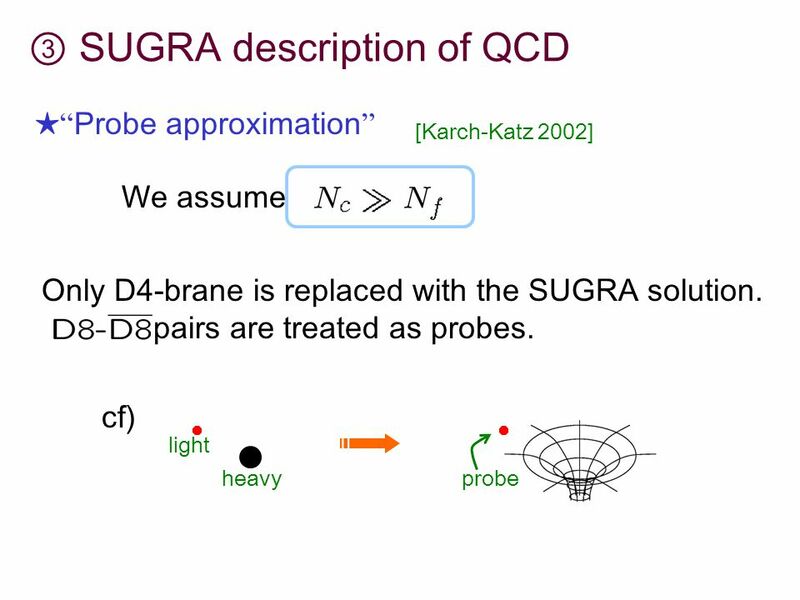 Topological current effect on hQCD at finite density and magnetic field Pablo A. Morales Work in collaboration with Kenji Fukushima Based on Phys. Rev. 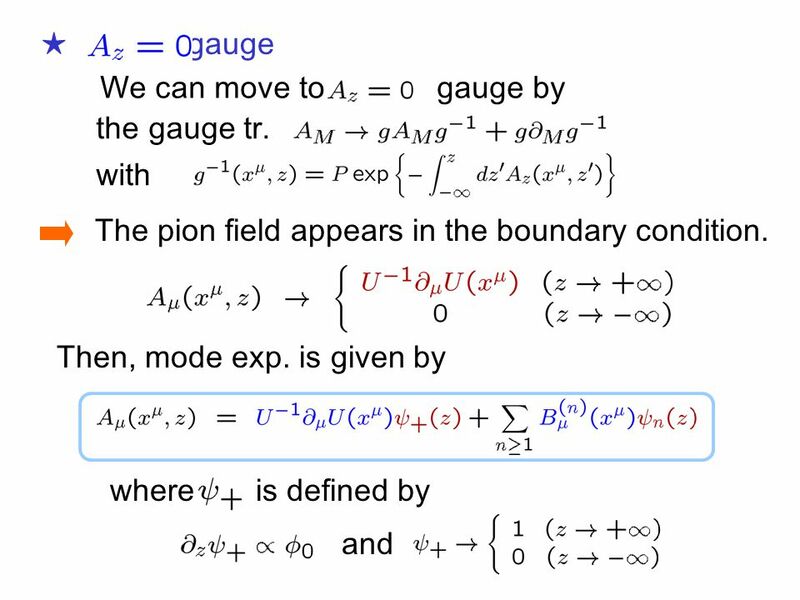 Gauge/Gravity Duality 2 Prof Nick Evans AdS/CFT Correspondence TODAY Quarks Deforming AdS Confinement Chiral Symmetry Breaking LATER Other brane games.